A 6.2-inch notch phone with 19:9 aspect ratio, dual rear cameras, Qualcomm Snapdragon 450 CPU, Adreno 506 GPU and a 4230mAh battery. The lowest price of OPPO A3s is P5,500 at ebay philippines, which is 45% less than the cost of A3s at Lazada (P9,999). This smartphone is available in 16GB, 32GB storage variants. 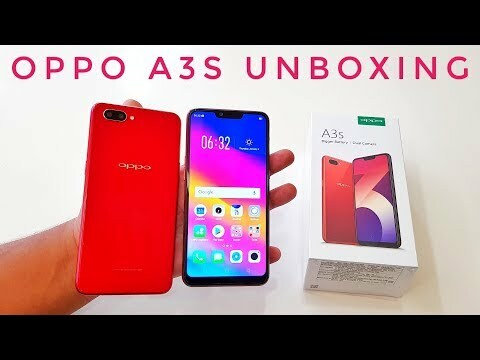 The latest price of OPPO A3s was updated on Apr 24, 2019, 12:31. The OPPO A3s is quite similar to the OPPO A5. It is an eye catchy smartphone with a glossy unique design. It has a rear panel which has an elegant cover with light reflecting surface and reflects shadow from different angles. The phone is prone to smudges whether the screen or the rear panel so having a good cover will help avoid this. The rear panel sports a dual camera sensor which is placed horizontally and next to the sensors lies the rear LED flash. It has the logo of the phone in the center of the rear panel. At the left side, the volume rockers and a SIM tray are located. It can hold dual SIM cards and a microSD card at the same time. At the right side, you will the power button, At the bottom, there is the speaker grille, micro USB port, and a 3.5mm headphone jack while the top of the phone is completely blank. OPPO decided to ditch the fingerprint sensor which we even saw in its previous launches like OPPO A83 and OPPO A83 Pro which is quite disappointing to see in a budget range smartphone but the new OPPO A3s has compensated well for its lack of fingerprint sensor by installing face unlock mode which is quick and accurate to use. The OPPO A3s measures 156.20x 75.60x8.20 and weighs 168.00 grams. The display of the new OPPO A3s is one of the highlights of the phone. It sports a 6.2 inches IPS LCD Capacitive touchscreen, 16M colors with a 720 x 1520 pixels resolution, 19:9 ratio with 271 PPI density. It has an impressive aspect ratio which you won't find in any other budget range smartphone. As far as the cameras are concerned, it has a 13-megapixel (f/2.2) + 2-megapixel (f/2.4) primary camera on the rear and an 8-megapixel front shooter for selfies. The OPPO A3s runs on Android OS 8.1 Oreo. Provided with the newest design with the ColorOS 5.1 brings forth a brand-new UI system and operator interface. It is powered with Qualcomm SDM450 Snapdragon 450 Octa-core 1.8 GHz Cortex-A53 Adreno 506. It is efficient and capable of delivering good performances. It allows multitasking with ease and with no lagging issues. This phone will give you a good gaming experience but won't be able to run big games with high graphics. It comes with 2GB of RAM and packs 16GB of internal storage that can be expanded up to 256GB using a microSD card. It has a decent size to store all applications and files and a good thing is that the storage can be further expanded with the help of a microSD card. Now for its battery performance, the OPPO A3s has a massive 4230mAh Non-Removeable Li-Ion battery. This won't run out of power shortly as it can withstand all the processes throughout the day providing entertainment and still will have some power left. Connectivity options include Wi-Fi, GPS, Bluetooth, and Micro USB. The phone's sensors of the OPPO A3s includes the Compass/ Magnetometer, Proximity sensor, and Accelerometer. The OPPO A3s is available in 3 color options, Red, Dark, and Purple. OPPO is one of the leading mobile brands in the Philippine market. On July 15, 2018, when it was officially released in the Philippines, and as expected from OPPO avid users everyone is waiting on queue to check how this new mobile series works. Its official price in the Philippines is Php8,000.00, which is affordable and matched with an amazing phone specification. OPPO A3s is one of the phones that are in demand, Filipinos will surely not miss this one of a kind OPPO smartphone. Wala bang flash sa main camera ng a3s? Totoo ba Hindi magamit and SD card sa oppo a3s?